So sorry for your loss. Knowing the details is not going to bring her back. Thanks for the updates. I plan to attend her memorial service. I am keeping tabs on the plans for that event. I think of her daily and miss her. Peter, So sorry for the loss of Jenny. I off trail hiked with her four times in the last few years. She was very good and knowledgeable in the mountains. It was her passion. I know that the other SMHC club members whom off trail hiked too will all miss her. She was a great person and I was fortunate to know her. Peter, I am very sorry for your loss. I got to know Jenny through Bob, and enjoyed a good many hikes with her all over New England and NY. I had been looking forward to re-connecting after her planned move to St. Johnsbury. She was a truly one of kind person, and I felt glad to call her my friend. I hope to travel from VT for the hike. 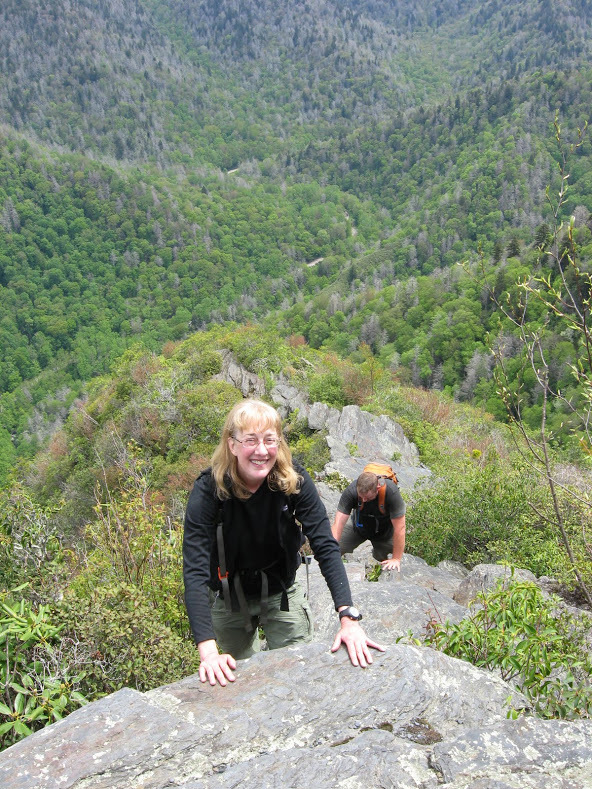 The Smoky Mountains Hiking Club will conduct a memorial hike for Jenny Bennett on Sunday, September 13, 2015, with a potluck lunch time of fellowship and reflection following at the Porters Creek Pavilion. Peter Bennett will be present. Jenny’s good friends and former colleagues Stephanie Gott Seay, Steve Seay, and David Massey have planned a loving memorial which will touch on the many and varied facets of Jenny’s life. There will be opportunities for those gathered to talk about Jenny and offer their thoughts and stories. We hope to have music by James Carlson, who collaborated with Jenny for the music and poetry for the 75th anniversary of the GSMNP. Any offerings of art, poetry, pictures and music that commemorates Jenny are welcomed. There will be a bulletin board available for the posting of pictures and/or stories. You may also offer your stories about Jenny in written form for reading aloud by others. We want this to be a very special time in Jenny’s honor and memory. We will gather at 2 PM at the Porters Creek trailhead and hike to the SMHC cabin to disperse Jenny’s cremains. We will return to the trailhead by 3:45 and move to the Greenbrier/Porters Creek Pavilion to begin the 4 PM picnic. Please bring a dish to share (which can be dropped off at the Pavilion prior to the hike). The SMHC will provide utensils and drinks. The celebration time of Jenny’s life will follow the picnic. If you would like to carpool from Knoxville, please meet at the Comcast parking lot on Asheville Hwy. at 12:45 PM. Hike: ~3.5 miles round trip, rated easy. 90 miles x 8c = $7.20 as a suggested contribution to carpool drivers. Directions: Take I-40 east to Exit 407, then TN-66 south to Sevierville. At traffic light #15, turn left on TN-448, to 0.5 mile and turn left on US-411. In 3.4 miles at a traffic light turn right on TN-416 and drive 15 miles to US-321. Turn right on US-321 and then in 0.3 mile left on Greenbrier Road. Drive 4.7 miles to Trailhead parking. The Greenbrier/Porters Creek Pavilion is on the right 1 mile before the Porter’s Creek trailhead. The event is open to the public, you do not need to be a member of the SMHC to attend. Save the date, and join with us in commemoration of the life of this remarkable woman. I haven’t kept up with the blog all summer and just heard the new. I’m sorry for the loss. Peter, I’m so sorry. I’ve been wondering why I’ve not been able to raise her on any of her email addresses. I’m terribly sorry I didn’t know and thus could not attend this event. I don’t believe we’ve met. I was her boyfriend for a while just after New College. We lived together in Cambridge for a while. While she was living in Massachusetts we saw each other fairly often. This is a blow.